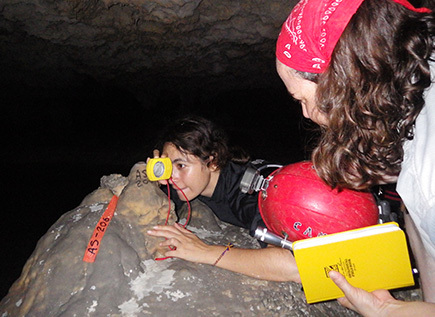 Fernanda taking readings from a cave survey station out to a new logger installation. Fieldwork typically starts with retrieving the loggers deployed on the last visit. Over the last year Rio Secreto has grown to become our biggest single installation, so it is usually the first place on our visit list. It helps that they have plenty of dedicated staff to help out, and Fernanda Lases was able to join us for the day of collecting loggers and surveying their locations. As we gathered the drip sensors, we did manual counts of drips/15min, and took notes on the overall appearance of each installation. A couple had been knocked over by high water events, but most were still perking away happily where we had left them. Note: The black line on the drip record is a daily (96 point) moving average. The temperature record is from the DS3231 RTC inside the logger housing, which only has 0.5°C resolution. My other tests have shown that they are much more accurate than the ±3°C that Maxim specifies. I was not expecting to see reduced counts. 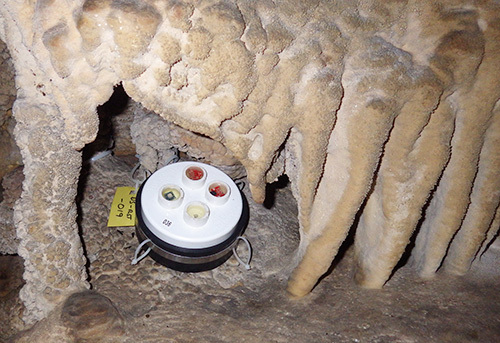 Trish mentioned that she has seen up to six month offsets between surface precipitation and cave drips, but that was in some caves on Vancouver Island. I’m still scratching my head on this one as there is precious little soil in the area, and I would have thought the limestone was just too porous to provide much storage. There was no direct moisture contact with the RH sensor. That’s a decent barometric record from the MS5805-02, and at least a hint at the results I might be able to squeeze out of the Mason’s hygrometers if that design can resolve the small wet bulb depressions we will see with humidity bouncing between 95-98% all the time. The R.H. breakout circuit board was still clean & shiny under the epoxy, with no evidence of moisture intrusion, so I think this high humidity environment is just too much for those humble HTU21D’s. The spike in that record coincides with thunderstorms that hit the area on June 13-14th, and the local weather records indicate that 5 to 6 cm of rain fell per day during that period. It is interesting that both water level and water temperature return to their previous trends so quickly, and I am keen to see if that precipitation shows up in our other records from further down the coast. If I go all squinty, I can convince myself that some of the drip records were affected by the event, but most of them showed no effect at all. Even baking under the full tropical sun, fungus still managed to colonize the ABS plastic on the cap. That is one tough little organism! Unfortunately, I can’t confirm the rainfall directly because both of my surface drip sensors croaked. The older 024 unit suffered an SD card failure (as it did last time) and the newer 034 unit drained it’s batteries rapidly when the ADXL345 started self triggering, which would have kept the mcu awake and drawing full power the entire time. The prime suspect in both cases is thermal cycling, with our hardy RTC’s showing some 60°C peaks. It’s worth noting that after replacing the sensor & SD cards I managed to get both loggers working so the 3.3v Rocket Ultras I am using survived the high temps. The DS3231’s had less than 10 seconds of drift after the ordeal. Hopefully the new rain gauge housings I’ve brought along this trip will shield my little drip sensors well enough to prevent this from happening again. I’m sure it doesn’t help that I have the accelerometers set to fairly high sensitivity for this application. Trish handles the big-picture analysis when we have so many logs to go through, but there are always plenty of ‘mini’ experiments buried in the data for me to chew on: including confirmation that the loggers pin-powering their RTC’s during µC up-time saw coin-cell voltage drops between 0.03 – 0.1 volts. And these units did not see clock drift significantly different than the non pin-powered units (~5-10sec / 4 months), giving me confidence that this method to reduce sleep current is worth adopting on more of my builds. (though I will be tracking things with a 4.7meg divider) The small drifts that I could confirm all seemed to have the clocks advancing, rather than loosing time. Given all the μSD cards I’ve killed off in the surface loggers, it seems pretty incredible that some people have been re-flowing SD cards directly onto breakout boards. That requires bringing them up to about 200°C for a short interval. Clearly long term medium temperature exposures are not the same as short high temperature ones. I’ve also had a fair number of cards “shake” from their holders during a deployment, so this soldering idea got my attention. 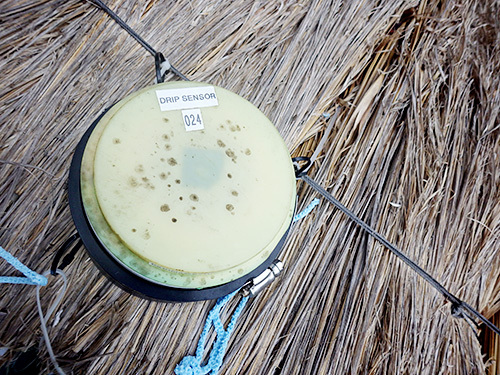 This entry was posted in Developing a DRIP ⚶ sensor, Expedition Reports & Updates on August 21, 2015 by edmallon.